Recently, I participated in the IT Leader GROWTH SUMMIT 2018, an all online event targeted to helping IT managers improve their success. The reason I participated was because it reinforces my company mission: “helping IT managers of the world achieve more success”. There were over 50 speakers from many parts of the world during the 1-week agenda so it was truly an international event. Lots of fun plus I learned some things. First was an interview we recorded on the topic, “Attack the Triple Threat to IT Success to Achieve More”. It includes a short training segment followed by a candid interview with me about aspects of the Triple Threat that exists in companies around the world. The second part was to lead a group discussion on the topic, “Let’s Chat About the Modern IT Organization”. – What do you focus on initially in a new CIO role? – How do you position IT more strategically? – How can IT break out of the purely technical narrative? – What is the role of the IT Leader in strategic business discussions? – Who are the people in the C-Suite that the IT Leader should partner with? – Is communication that important? And if yes, what type of communication? Priority Matrix is a powerful task management and workflow system that gives businesses in all industries significant advantages in productivity and accountability. 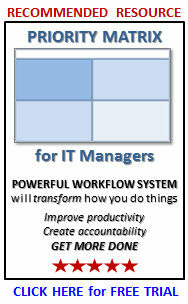 While it delivers value for all levels of managers and employees, it is especially adaptable for IT organizations. I discovered Priority Matrix by accident. Actually, people in Appfluence (the company that developed Priority Matrix) discovered and contacted me about the possibility of interviewing me to learn more about IT managers and IT organizations. Inquiries like this happen fairly often and I don’t think too much of them, but on a rare occasion I stumble upon something special. This was the case with Priority Matrix. At first, “I didn’t get it!” They gave me a demo and walked me through the system and I was impressed, , , sort of. Then I started using the system on a real project and WOW, it hit me like a ton of bricks. I suddenly realized that I had actually stumbled upon a system that will change the way you work and help you become significantly more productive as well as improve accountability and communication within your organization. These are strong words so I think taking a look at a new user will be of benefit. Strattec is a large global manufacturing company based in Wisconsin. The company makes customized auto parts for many of the automobile manufacturers. Beth Ackley is their Director of Information Services. I first met Beth in 2004 when she attended my 4th IT Manager Institute. Since then she has put many of her managers through the program. As I’ve gotten to know Beth I have always been struck by the fact that she approaches her IT support business very practically and she has a keen sense for supporting the business and delivering business value. In our discussions it is always apparent she is motivated as the Head of IT to help her company be more successful. I worked with Appfluence for a few months to better understand the Priority Matrix system and to create some targeted IT manager templates. Then, I created an awareness campaign in late June of 2017 to make IT Manager Institute graduates aware of the power of the system. After doing her due diligence work and taking advantage of the Priority Matrix free trial period, Beth purchased licenses for her team. I initially interviewed her after she had gained about 60 days of experience in using Priority Matrix. Then, we talked again after about a year of experience with Priority Matrix. Here is what I found. Beth initially rolled the system out to just her IT managers and a few key people so they could gain insight and experience in using the new tool. This “test group” focused on discovering the best ways to use the system within Strattec and how to bring new users up to speed. Their implementation included internal training along with training from Appfluence plus I spent time with Beth to show her some of the highlights I had discovered in using the system. At the time I caught up with Beth to explore how her team was using Priority Matrix she had 26 people in her IT organization using the system. Her ultimate goal was to have the entire IT team of about 45 IT employees using Priority Matrix by end of the year. Her team stays very busy as do most IT organizations these days. In the interview she indicated they had approximately 65 active projects underway in various stages. Many of these projects are now managed and tracked using Priority Matrix. While Beth’s IT team initiates efforts to standardize certain project types and processes using Priority Matrix, she stated that each person tends to use the system individually or a bit differently than the next person. This is an important aspect of Priority Matrix; it is very flexible so the system adapts to how you want to use it, not forcing you to use it in a predefined way. The system is very intuitive. A quick orientation from a more experienced user makes the learning much faster. Master List – This feature allows you to see all your To Do’s for the week plus you can see across your team and what they need to get done. This makes you aware of what’s going on and puts you in better control. Beth believes this feature is really a strong selling point of the system. Eliminates confusion – Each customer has a Priority Matrix project which creates a single place to record all to do’s and issues that take place with the customer. Collaboration – The ability to collaborate in real time to resolve issues, complete tasks, and to discuss things proactively improves productivity and helps you get things done. Ability to find things easily – All the components dealing with a project, a client or whatever you use Priority Matrix to track can be stored in one place. This makes finding things easier and much more productive than the “folder chaos” we normally go through. Deadlines and accountability – The ability to assign responsibility and due dates to tasks allows you to see what’s going on and anticipate things that need to get done. Beth mentioned that one of the great things was to be able to start Monday morning with the ability to all that needs to get done this week. Heat map – This feature helps you see the workload of your employees so you can make adjustments to balance workload when needed. Intuitive user interface – One of her programmers picked up the system in 10 minutes. Just a little insight makes using the system quick and easy. Beth and her team are one year into the use of Priority Matrix and they continue to discover additional benefits as they use the system. Their initial experience appears that the system is delivering many tangible benefits and is changing the way they work so her team can become more productive and accountable as they get things done. We often think others know something when in reality they may not. Don’t always assume your employees or your clients know what you know because they probably do not. I wrote an article for TechRepublic once about using a project scheduling template to help me monitor and manage a project. In just a few days there was over 15,000 downloads of this template. It was one of the simplest tools I have and I was amazed at how many downloads took place from that one article. My brother told me he had discovered this new technology gadget. When he tells me something like this, there is usually something pretty neat I’m about to learn about. Then he shows me a wireless PowerPoint Presenter device. I thought he was kidding because I carry one with me all the time and have used these devices for 10 years. He wasn’t kidding, , , he had just discovered it. Early in my management career I discovered the team I was managing didn’t know how to troubleshoot a client problem. They had significant experience with the technologies we were supporting but struggled in defining the problems and underlying issues causing them. It was a surprise and an example that employees can sometimes lack the basics. IT managers need to coach employees the fundamentals just like they do in sports teams. 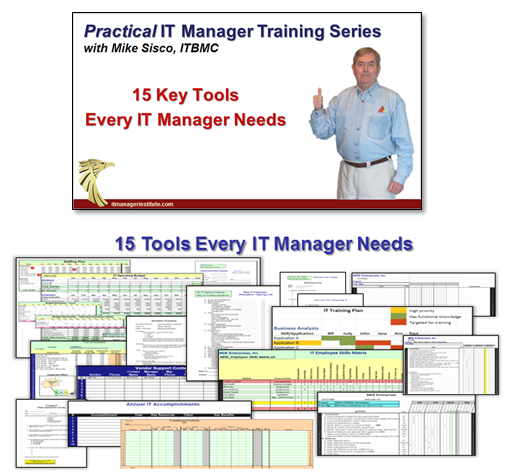 The point of all of this is, “Don’t assume others know what you know.” I see it all the time in my IT Manager Institute classes, , , many of the basic processes or templates I share are game changers for some of our students, , , and sometimes they have been managers for many years. Don’t assume others know what you know. It would be a big mistake. Managing an IT organization requires many skills to succeed in today’s fast paced and complex world. 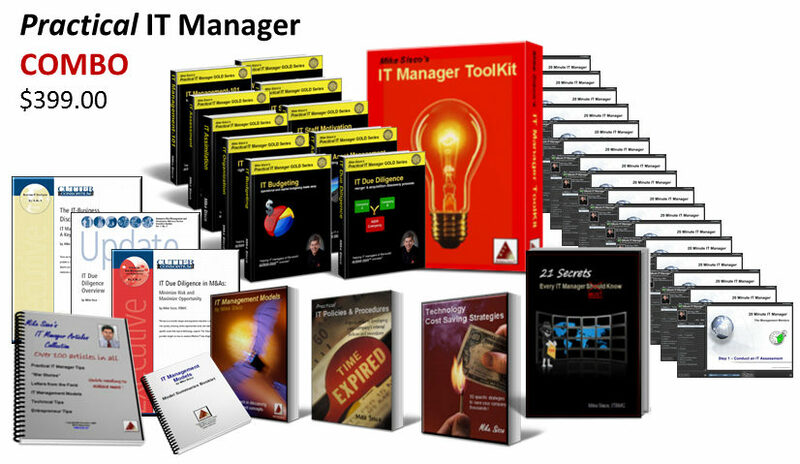 IT managers are required to juggle several issues at the same time and meet ever-increasing demand from their clients (senior managers, department managers, users) and from their IT staff. 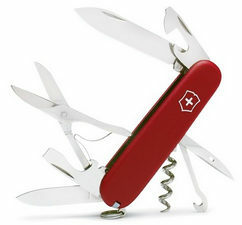 It’s like we need a Swiss army knife to help us handle all the challenges of managing an IT organization. A single function knife blade will no longer do the job, , , we have to become skilled in multiple capabilities. On top of managing today’s technology support environment and issues, IT manager responsibilities are constantly changing. 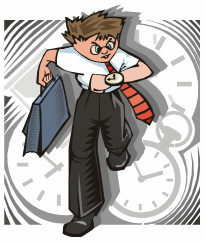 Client priorities seem to shift like the wind from month to month, maybe even from day to day in your situation. Technology is changing faster than ever, , , and the pace of change will only increase in the future. To stay current with today’s technologies is tough now and will be more difficult in the future. There will be technologies in two years that are not even on the drawing board today and will make some of the technologies we use today obsolete. 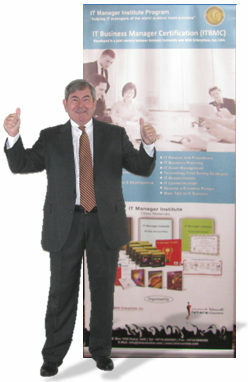 It is difficult, if not impossible to be a technical expert in today’s environment and also be a strong manager. Client need is evolving and increasing in demand as new technologies emerge. Sounds like an impossible mission, doesn’t it? Technology is changing so fast. Client demand for technology is increasing and changes all the time. The IT manager, especially the CIO must understand the needs and issues of every department in the company, not just the IT Department. No other manager in your company is required to do this to be successful, , , only in IT. IT people are different and can be challenging to manage. How do you attack these challenges? First and foremost is that it’s important to realize, “You don’t have to be an expert in everything.” Even if you had the brain power and capacity to learn it all, you won’t have enough time in the day to be the expert in all areas. What this means is that you need to prioritize and focus on what you believe is required in your circumstance. Every situation is different. Become a prolific reader to learn things and to improve the knowledge and skills needed in your profession. Augment existing skills with training and education that will add new skills in the areas you need them. Find mentors who have experience in the area of responsibility you have or that you aspire to. Identify internal and external resources who can help you “cover all the bases”. Learn to delegate and rely on these extra resources to handle issues outside your expertise. A key to doing these things is that you must spend some time to assess what your organization (company and IT Department) needs from you. Next, do an objective and honest skills assessment of yourself. What are your current skills, and how strong are each of these skills relative to what is needed? Finally, create a plan of attack to develop your skills where you see gaps in what is needed versus what you have. Give this part plenty of thought and prioritize your efforts. IT people have a strong tendency to want to do everything and do them to the “nth degree”. Not necessary, plus it only serves to overwhelm you which will prevent you from accomplishing as much as you could if you keep your list short, focused and reasonable. Remember, you don’t need to be an expert in all areas, , , just competent in most and expert in a few. 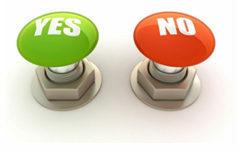 Choosing which areas you will become an expert in is subjective and depends upon the situation you have. Making these choices will be a challenge, , , but part of managing well is making decisions and choosing “what not to do” sometimes. Not an easy thing to do but it will help you manage to what is possible and not what our minds tell us is desirable. Identify where you will develop additional skills and where you will rely on others (either internal or external resources) to provide the organization the complete set of skills needed for success. Swiss army knives come in all types of configurations. So too do the needs of IT management positions in companies. Not all positions require the same set of skills, , , every situation is somewhat unique, so the skill requirements can and should be different. Let’s use my personal example to explain. I’m comfortable managing programmers, business analysts, and Help Desk environments, but when it comes to managing some of the infrastructure resources (specifically Network and Systems Engineers), I need help because I don’t have this technical background. So to the points I’ve been making, I find resources who can competently fill the technology expertise needed in these technical areas to compliment the set of skills I have. I’m not going to become an expert in networks, security, and systems, , , but we have to have experts in these areas to support our business. I’ll either rely on someone internally (hopefully) or will bring in help from the outside to provide the skills we need. Build the “Swiss army knife” you need for your situation, , , one that gives you the skills and tools to be successful. And don’t forget to also develop resources you can rely on with additional capabilities to handle issues in areas you choose to delegate and rely on others for. 2014 was a solid year with 9 more IT Manager Institute programs. We expect 2015 will also be a great year. Below is the current schedule for 2015 classes. I’m sure you have seen a situation when a problem occurs, , , no one seems to know how or why it occurred. No one wants to fault others for problems that occur. But a small fact exists, , , strong leaders take responsibility and hold themselves accountable, , , weak leaders pass the buck. On the other hand, a transparent manager will always deflect a problem to someone else, even his own staff. Transparent managers take credit for good things and pass the blame for problems. Guess how much credibility transparent managers have with their clients and more importantly their staff, , , little to no credibility. Strong managers take the hit when problems occur and they go further by identifying what they are doing to get the train back on the track and to prevent similar problems in the future. Managers who “own the responsibility” instill confidence and respect plus the all important credibility because they hold themselves and their organizations accountable, , , then they do things to improve. Bottom line: Give your people credit for successes and take the responsibility yourself for failures, , , it will reward you with trust and loyalty over time. One of my favorite movies is Gladiator starring Russell Crowe. It’s not for the fighting and action, , , it is for the first five minutes that lead up to the battle scene. Let’s step back a moment and I’ll explain why I’m writing this article. One of my first managers was an IBM Systems Engineering manager early in my career. Bryan gave me some excellent guidance and recommended one thing the very first week I met him that I’ve always remembered. He suggested that I should, “observe others and incorporate the good things into my own approach to doing things and avoid the bad things”. In other words, take the best of the best as you develop your own style and way of doing things. It was a powerful piece of advice that has helped me throughout my career. I observe management techniques and leadership skills in all walks of life. For example, one of the best managers I know is George Ippolito, an Italian restaurant owner. George does such a good job that he has tremendous repeat business and staff that stays with him for years, something that’s rare in the restaurant business. He is successful because he earns it every day and he coaches his employees how to deliver excellent service. The movie Gladiator got my attention immediately. It was the first five minutes that gave me chills as I recognized leadership skill after leadership skill. Much of it is subtle, but I can assure you the leadership and management traits are there and they are great examples that can be applied in your IT world. The movie is a fictional piece of work, but there are valuable insights that come from what you see in the first five minutes. In this first scene Maximus Meridius, General and Commander of the Northern Legions of the Roman Army, is taking a moment to reflect and prepare for one final battle after years of war. He returns to his army to meet briefly with other generals to finalize the coordination of the Roman cavalry and infantry attack on the German warriors. As he walks through the ranks of his infantry, you see something very powerful. What you see is admiration and respect, , , not just from the soldiers, but from both soldiers and from the General. He even stops to speak with one of the soldiers who has a head wound and taps him on the shoulder. You see mutual respect for one another and you get a real sense that both men would do anything to help the other be successful. In the first five minutes of the movie there are at least 15 examples of leadership and management, , , if you are looking for them. Whenever I need a morale boost, I pop Gladiator into the DVD player and watch the first five minutes. It’s all I need for a “pick me up”. Leaders don’t always set out to become leaders. In fact, many leaders probably don’t even realize they are leading when in fact they are having enormous impact upon those around them. 1. They do the right thing. 2. They step up and make tough decisions. 3. They lead by example. 4. They respect and appreciate the effort of others (managers, peers, and subordinates). 5. They learn what works and implement replicable processes to succeed. 2. Process – There is a specific process used and replicated to achieve success. Each soldier knows his duties and is trained to handle them. 3. Supervision – Soldiers and the processes are supervised to insure things are carried out appropriately. 4. Motivation – The soldiers are motivated by having achieved success in the past and the goals that lie ahead with one final success in battle. Maximus also delivers a motivational pitch to his cavalry just before the attack to motivate his men. 5. Inspection – Generals inspect components of the plan and processes underway, , , they know that inspection is a key for success. 6. Strategy – The Roman Legions have a simple, coordinated battle strategy that’s very effective. It takes advantage of each element of the army’s strengths and capabilities and attacks the vulnerabilities of the opposing force. 7. Planning – Planning is obvious as you see the battle unfold. Everything works like clockwork. A great strategy won’t work unless you are able to plan and implement effectively. 8. Providing tools and equipment for the job – The soldiers are well equipped and have the support they need to succeed. 9. Trained employees – Action is methodical and coordinated, a sign the soldiers are trained to do their job. 10. Backup – Maximus loses his sword as he enters the battle. A backup sword prevents downtime or loss. I’m pretty sure the General must have been a very early “IT guy”. 11. Delegation – Responsibilities are delegated to competent leaders within the army. One guy can’t do it all. 12. Communication – Communication is key, from discussions with other officers, motivational acknowledgements to the foot soldiers, to the rally delivered to the cavalry. Even the fire arrow signal sent to start the battle is an example of communicating effectively. 13. Leadership by example – Maximus doesn’t just bark out orders, , , he leads his cavalry into battle. The reason he has so much respect from all levels of the army is that he is willing to do what he asks of his men. He leads by example. 14. Treating others with respect – You can see mutual respect between the General and the men, , , it starts by the General sincerely respecting what his men do to win battles, , , even the lowest paid soldier in the army. 15. Teamwork – Soldiers of each component of the army work together as a team and all teams work in a coordinated fashion so the army as a whole can be effective in winning battles. Who would have guessed that so many leadership skills could be exhibited in the first 5 minutes of a movie? I encourage you to observe others and incorporate the positives you see into your management style. It can help you achieve more success and promote your career over time.